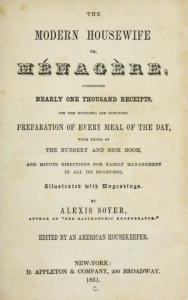 In his 1851 runaway best-seller, The Modern Housewife or Ménagère, Soyer offered up recipes for Gold Jelly, made with eau-de-vie de Danzig; a Maraschino Jelly imbued with quartered fruits; and Rum-Punch Jelly. London’s most famous French chef of the period, Alexis Benoit Soyer (1810-1858), was another mixed drinks champion. At the height of his career, Soyer earned more than £1,000 per year as the Reform Club’s chef: an outrageous sum of £100,000, if calculated in today’s market. He created the sumptuous Reform Raclettes of Lamb still served in London’s Reform Club. He designed the template for what would become the standard “modern” kitchen. He built an efficient, portable soup-kitchen that was stationed at the Royal Barracks in Dublin and fed 26,000 Irish Potato Famine victims daily. He developed commercial products such as Soyer’s Sauce and Soyer’s Nectar. He also created fanciful potables that may sound all too much like the 1970s through 1990s: Jelly Shots and blue drinks. First the blue drinks. The popularity throughout Britain of Schweppe’s fizzy drinks in glass bottles inspired Soyer to team up with the Carrera Water Manufactory & Company to create his own branded sparkling water, a sparkling lemonade, and a new soft drink: Soyer’s Nectar. Composed of raspberry, apple, quince, and lemon juices, spiced with cinnamon, and tinted bright lake blue, the carbonated drink was a trendy hangover cure for novelty-obsessed Victorians. By 1850, The Sun declared it far better than Sherry Cobbler. The Globe recommended adding a tot of rum and dubbed Soyer the “Emperor of the Kitchen”. His own advertisements suggested that “It may also be taken just previous to going to bed, with a glass of wine, such as Sherry, Madeira, etc, or of any spirit or liquor mixed in it, and drinking as much of it as possible as a draught.” The same promotion included recipes for three types of Cobbler. Author Ruth Cowen related another of Soyer’s contributions to the drinks world in her 2006 biography Relish: The Extraordinary Life of Alexis Soyer: his introduction of an American-stye bar in the configuration of a six-star restaurant. The same year that Prince Albert opened the Great Exhibition of 1851 and its fabulous Crystal Palace in Hyde Park, Soyer opened Soyer’s Universal Symposium of All Nations where the Albert Hall now stands. Reached via a wooden staircase in the building that was once Gore House, Soyer created an experience that would be grand spectacle today. Each room was lavishly decorated: one as a Chinese boudoir, another as a grotto, another a dungeon. One room boasted a table covered by a 400-foot-long tablecloth that sat 500 people. Amongst these settings he opened The Washington Refreshment Room with a beverage menu that offered up 40 different concoctions, including Hailstorms, Mint Juleps, and Brandy Smashes plus some of Soyer’s own inventions such as his Nectar Cobblers and Soyer au Champagne. Although he had interviewed “an eccentric American genius, who declared himself perfectly capable of compounding four [cocktails] at a time, swallowing a flash of lightning, smoking a cigar, singing ‘Yankee Doodle’, washing up the glasses, and performing the overture to the Huguenots on the banjo simultaneously”, he selected a West Londoner named William York to head his bar. Was that American Jerry Thomas? It’s highly unlikely as he had sailed from New York for San Francisco in 1849, and did not visit London until 1859 (at which point he was impressed enough with Soyer’s work to include six of his recipes in his 1862 book). The Universelle Symposium closed before the year was out due to massive financial complications. It left Soyer free to join his close friend Florence Nightingale in the Crimea, where he devoted his remaining days to developing military cooking equipment designed to provide healthy, efficiently-prepared meals for the troops. His Soyer Stove was readily adapted by British military personnel around the world. The unchanged design was used during the 1982 Falkland War. You can even see a cluster of them in the Michael Caine film Zulu.